I picked up Cosmic Forces last year when Llarowe happened to restock. (Emily de Molly is an Australian indie brand so it's hard to get in the USA). It was one of my biggest lemmings. #1 it's my favorite color, purple. #2... it's got those awesome holographic circles. Esther and I are friends on Facebook, and before the 1st craft fair had gotten canceled she said she had a #RAOK for me which was really sweet. 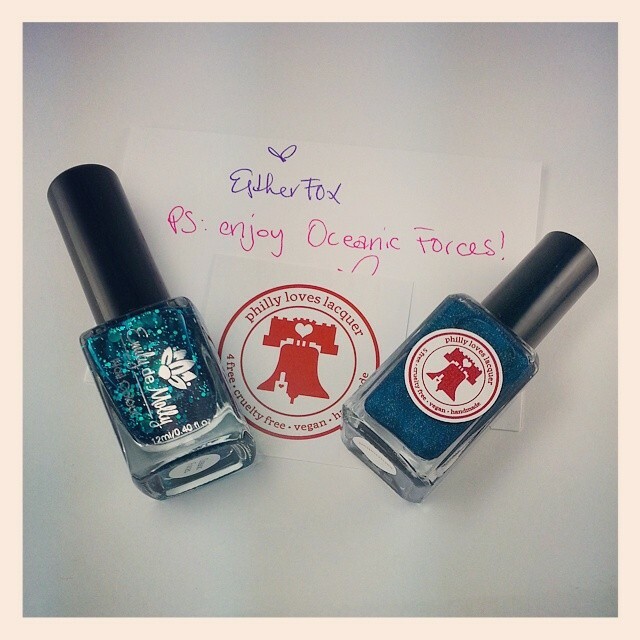 So, I had an included surprise when my Philly Loves Lacquer order arrived on Monday! I've probably never been so surprised opening a package... especially when it's something you've really wanted for awhile! She sent me Oceanic Forces. That was incredibly sweet of her to do. :) I will have to pay it (#raok) forward sometime soon.